Home Art How Can L.A. Keep Artists in the Arts District? Mural by Tristan Eaton in the Art's District. With the city’s housing crisis intensifying, the Arts District is in danger of losing many of the artists who transformed the neighborhood into the destination it is today. Tenants in at least three long-standing live-work spaces including 800 Traction, the Artists’ Loft Museum, and the Santa Fe Art Colony have either been served eviction papers or are in negotiations with property owners to stave off rent increases. Meanwhile, artists throughout the neighborhood are leaving as the cost of rent soars, reaching a median price of $2,210 for a one-bedroom apartment, according to real estate listing site Renthop. Last November, Los Angeles city councilman Jose Huizar proposed creating a subsidized housing program for artists. “Here in the city of Los Angeles, the value of our artists in making our city one of the most creative, artistically driven cities in the world cannot be overstated,” Huizar said in a statement. A report from the Housing and Community Investment Department is expected to be ready to be heard by April. If L.A. wants to keep artists in the Arts District, it needs to act soon. Here are four steps the city could take to stop artists from being priced out of the Arts District—and other neighborhoods across L.A.
Federal and city rules require developers to make certain low-income groups aware of affordable housing options in their buildings. For new projects in L.A., the city council is looking into designating artists as a group that must be marketed to by developers. “We must utilize mechanisms to not only create affordable housing thats meet the live/work needs of artists, but that include targeted and direct marketing outreach to the arts community to inform them of artist-friendly affordable housing opportunities,” said Huizar. 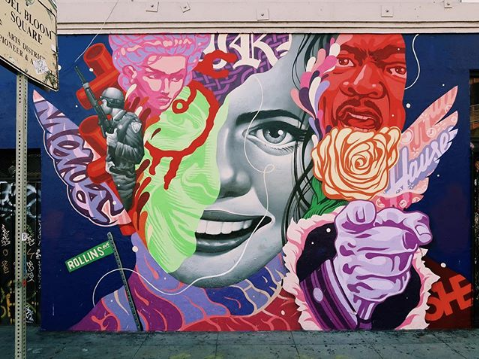 In 2014, the Los Angeles Department of Cultural Affairs partnered with the non-profit Los Angeles Downtown Arts District Space to reach out to artists directly. The department helped artists apply to 88 subsidized units at the One Santa Fe building in the Arts District. But Keating at LADAD Space says that simply making artists aware of the opportunity was not enough. According to Keating, the application process proved to be extremely competitive and only a few artists were placed in the massive complex. To ensure artists take advantage of the affordable housing that is available, the city could offer subsidies to developers in exchange for renting cheaper units to artists before offering the spaces to other applicants. In Glendale, for example, the local housing authority put up $6 million to help build 70 units of affordable housing aimed at artists as a part of a multi-use project developed by Meta Housing Corporation. But according to deputy city attorney Mei Mei Cheng, allowing for this kind of “artist preference” could set up L.A. for legal trouble. “If the impact of the preference results in a disparate effect on a protected class, that could cause liability to the city,” Cheng said at a city planning committee hearing in November. Cheng explained that state housing laws prohibit cities from discriminating against potential tenants based on how they make money, but that the law is not well defined. If L.A. were to create a preference for artists, she said, it could open the city up to lawsuits from groups protected by the laws. But the tax overhaul passed by congress in December amounts to a cutback to the program and could hamper the construction of new affordable developments. The city could also lease or sell publicly owned land to developers at below-market value in exchange for creating housing for low-income artists. Teri Deaver, vice president of Artspace, said her nonprofit works closely with cities and developers across the country to build affordable live-work spaces. “A lot of cities recognize that this is a population of our low-income community that we are not serving well currently,” says Deaver. One of Artspace’s largest projects is a converted tannery in Santa Cruz that boasts 100 affordable live-work studios. The city of Santa Cruz retains the title to the property and is actively involved in ongoing development at the lofts. Deaver says organizing these types of projects in downtown L.A. could be difficult because the city has relatively little public land to develop. But she pointed to a mixed-use development slated for construction atop a city-owned parking lot in Hollywood as a promising local example. Spearheaded by the nonprofit Actor’s Fund and overseen by the Los Angeles City Council, the Hollywood Arts Collective will make 60 percent of its 72 units affordable and aimed at artists. The project is currently in the pre-development phase, including community outreach and seeking government approvals, according to a representative from the Actor’s Fund. In the wake of the deadly Ghost Ship fire that killed that 36 people at a warehouse in Oakland, cities across the country have cracked down on unpermitted live-work spaces. Days after the tragedy, Oakland mayor Libby Schaaf signed an executive order to improve safety at illegal dwellings without forcing out residents wherever possible. Groups including the Oakland Warehouse Coalition and Safer DIY Spaces sprung up to work with the city to bring illegal-use spaces into compliance. The results so far have been mixed, as many Oakland artists reportedly say the city’s code enforcement officers are more focused on evictions than working with artists. In L.A., there have been numerous reports of artists who have been forced out of unpermitted lofts by the city since the Ghost Ship fire. Instead of handing out eviction notices, the city could partner with artists to help bring downtown warehouses up to code under its adaptive reuse ordinance, which allows commercial buildings to be converted to residential units in certain neighborhoods.